Last winter I spent a disproportionate amount of time kvetching about my boots to Tristan as we walked the dog after dinner each night. Our rural street is sidewalk-free and not a bus route, so it spends most of the winter with a hardpack of icy snow on it, and I hate, hate, hate walking on it when it’s slippery. It makes me feel like a little old lady as I totter along, focusing all my attention on ensuring that my feet are not about to go sliding out from under me. That’s no way to pursue my daily goal of 10,000 steps, with teeth clenched in anticipation of a fall. Do you remember this article about how most winter boots fail even the most basic traction test from last winter? 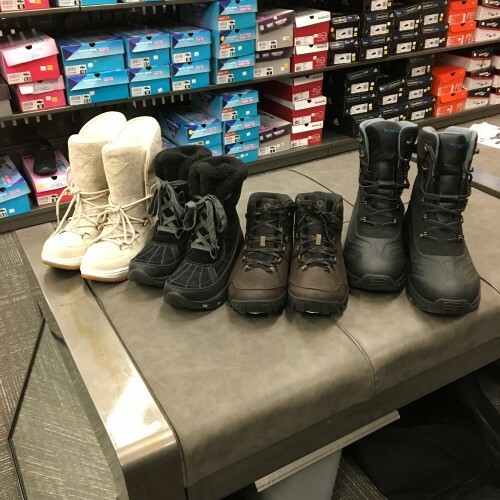 Of course my boots were not on the list, and I spent the whole winter idly wondering whether better boots would make for more enjoyable winter walks. It’s not the cold temperatures that keep me inside on winter evenings, it’s the fact that I just don’t feel comfortable walking on the ice — especially holding a dog prone to lurching at snowflakes and shadows. I learned on my visit to Mark’s that depending on the boot manufacturer, there are a couple of different types of anti-slip technology. Boots made with the Green Diamond (as seen in this Cascade model) and Vibram’s Arctic Grip (as seen in these seriously adorable Sperry boots) technologies have granules in the soles you can actually feel. They’re slightly different from a technology standpoint but the outcome is the same – improved traction on wet and dry ice. What was really fun is that they’d brought a giant slab of ice right into the store, so I could try out the various anti-slip technologies. I have to admit, I was impressed. 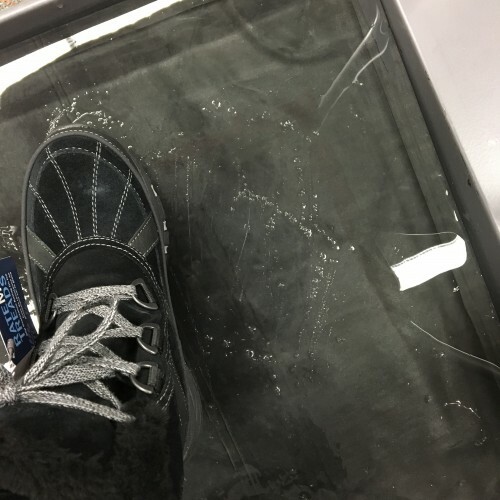 First I just sort of kicked at the ice, but then I really tried hard to slide across it and it was like trying to skid across a hardwood floor with those little grippy things on your socks – I could feel the boots literally digging into the ice. You can see here where I’ve made scratches in the ice trying to skid. Over the years, I’ve tried a few different cleat and crampon-type solutions and have always been frustrated by them. Either they’re a hassle to use, or they fall off, or they destroy my 20m wooden porch as I traverse it from the front door to the driveway. It makes so much sense to have a gritty texture baked right into the soles of the boot, and it’s so thoroughly embedded that even as the rubber wears away through use, new bits of the grippy grit material are exposed, ensuring you many years of traction. The article I referenced earlier was based on a study that’s put out by iDAPT, part of Toronto Rehabilitation Institute – University Health Network, called “Rate My Treads.” It’s a very Canadian innovation: they’ve set up a lab to test the slip-resistance of boots by having real people walk in the boots across icy surfaces in subzero temperatures with winds up to 30 km per hour. They traverse an incline and give snowflake ratings based on the boot soles’ ability to maintain traction. They found last year that more than 90% (!) of the boots they tested did not meet their minimum standard for slip resistance. 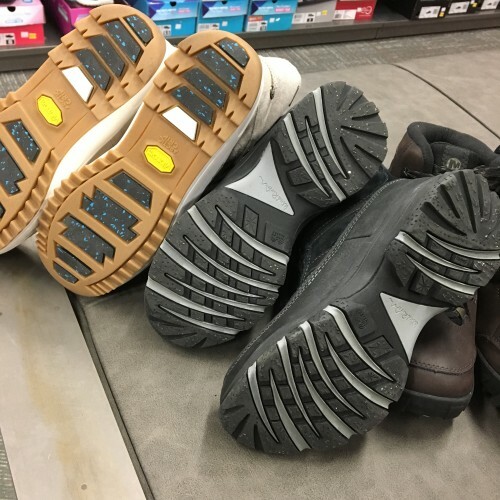 Mark’s carries several of the brands that did meet that minimum threshold, though, including Merrell, Sperry, and Wind River. See the full list of boots that iDAPT tested and rated here. Are your winter boots on the nice list or the naughty list this holiday season? Next post: Facebook launches a version of Messenger – for kids?! ?